The perfect PERSONALIZED "She Believed She Could So She Did" Purple Watercolor Journal Notebook! 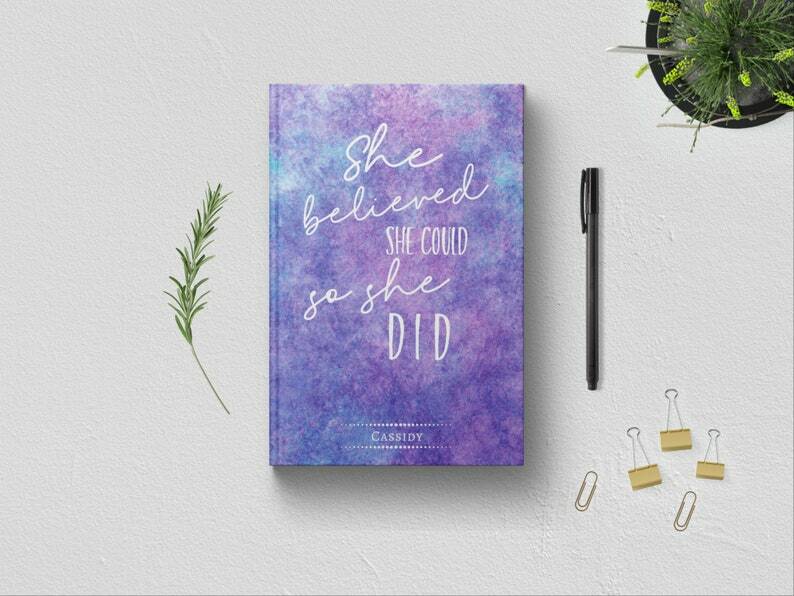 Be inspired to do so every day with this blank notebook journal featuring the motivational and uplifting quote "She Believed She Could So She Did" on the elegantly designed purple watercolor cover. "She Believed She Could So She Did" Notebook Journal is the perfect gift to any of the special women in your life: girlfriends, daughters, sisters, and mothers. Makes the perfect gift idea for Graduation gifts, Birthday gifts, Mother's Day gifts, Christmas gifts, and just about any occasion. • Features a custom name on the gorgeously designed purple watercolor cover, featuring the quote "She Believed She Could So She Did". I got this as a gift for my friends birthday and she LOVED it! It turned out so nice and the turnaround time was excellent. Shipped on time and made a perfect gift! Thank you so much.